Plover, WI – March 1, 2019 – Women in Trucking (WIT) has announced Rachel Bothwell as its 2019 March Member of the Month. Rachel is a professional city driver for FedEx Freight in Rapid City, South Dakota. 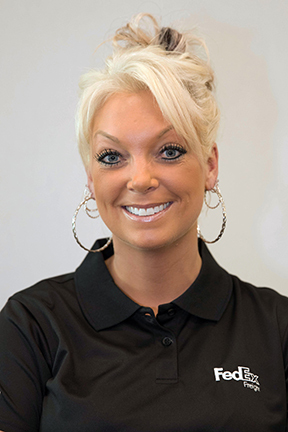 Rachel’s trucking career began while growing up on a dairy farm in Minnesota. Trucking was a way of life on the farm, whether they were hauling grain to the elevator or hauling livestock to and from the pastures and sale barn. Being behind the wheel of a semi truck became natural for her. So natural in fact that before she graduated high school, she took a job working for a local farmer helping him in the fields and hauling grain for him. After high school when she turned 18, she took her CDL test. This was before schools in her area had CDL programs. Then, Rachel began working for a custom hay bailer and hauled loads of hay to big horse barns in the Twin Cities. For five years, she custom bailed and hauled hay. After doing that, she felt it was time to spread her wings, so she left Minnesota for the first time and moved to Wyoming. In Wyoming, it was easy for Rachel to find a job in the trucking industry as the oil and coal booms were in full swing. She began a new journey, hauling explosives into the coal mines. Hauling hazardous materials was a very exciting and educational experience for her. While living in Wyoming, she met her husband, who at that time had just retired from a 20-year, bull-riding career. He had just started a rodeo contracting company which only involved bucking bulls. After dating for a few years, they decided to move to South Dakota. Once relocated to South Dakota, Rachel’s life and career truly bloomed. Not only did she get married, but she was also introduced to the world of bucking bulls. “I have always had a love of rodeo and horses but this was a whole new level for me. Our rodeo company has taken several years to build and has really taken off. We have one of the largest benefit bull ridings in the state of South Dakota with over 2,000 spectators who come to our place each year. We are able to give away nearly $10,000 in scholarship money each year. The community support of this event has been absolutely amazing,” she said. During this time, Rachel also decided on the career choice to become a city driver for FedEx Freight. “Working for FedEx Freight has been the most life changing and rewarding job I have ever had in the trucking industry. I have been with FedEx Freight for nearly seven years and due to the company’s support and the support from the trucking industry, my CDL has taken me places I would have previously never dreamed,” Rachel said. One of those places is truck driving championships. She feels that being able to compete at TDCs has provided a confidence-building atmosphere where there is a great sense of camaraderie and respect for fellow drivers in the industry. Rachel’s CDL has allowed her to become a part of the FedEx Freight Road Team as well as become the first woman in South Dakota to be named a road team captain for the state. Being able to promote the message of safety and sharing the road with trucks all over the country has been a rewarding experience for her. “It is not something that I would have been able to do without pursuing my career as a truck driver and without the support of my family and FedEx Freight,” she said.